the budget was passed by a majority of votes. JVP had decided to vote against the budget while the Tamil National Alliance has resolved to cast their vote in favour of the budget. 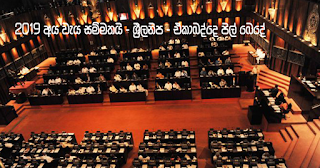 It was a special feature that the Joint Opposition had decided to vote against the budget while the Sri Lanka Freedom Party had kept away from voting at the budget. It was conspicuous to observe that the SLFP faction supporting Maithri has declined to vote while the United Opposition has not come into an agreement on this matter until the last moment.